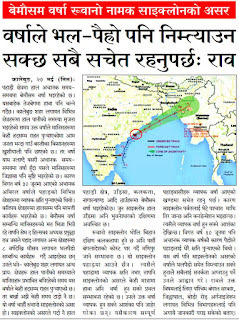 Since many people of this region were unaware about the cyclone, we had a report on Cyclone 'Roanu' published in Himalaya Darpan along with the track of the storm. Himalaya Darpan is a Nepali language newspaper which commands the largest readership amongst the local people here. Briefly the report states that the yesterday's rainfall was not due to the SW monsoons which was still a fortnight away but due to a cyclone. We asked the community to be alert in case of possible heavy rain and ensuing landslides. You can Book cheapest Andaman Tour Packages, Tour operators in Andaman, top travel agent in andaman, Andaman family tour, Andaman Honeymoon Tour, Andaman Beach Tour, Andaman Holiday Tour Packages, Travel Tourister. Travel Tourister is a Premier Destination for Domestic and International Tours, Travels and Holiday Packages. Choose India's best for andaman holiday tour and andaman tour packages with pure jain veg good. For Booking Call on 9971482795 OR Visit www.traveltourister.com. Gill Grewal Taxi Service provided best and cheapest taxi service in ludhiana and delhi to ludhiana one way taxi services, amritsar to delhi one way taxi service and also round trip from ludhiana to amritsar and chandigarh. Contact For ludhiana taxi service At +91-9914994200 .